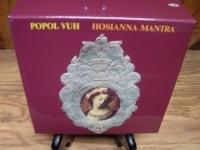 "Popol Vuh Hosianna Mantra - 8 CD OBI Box Set"
POPOL VUH HOSIANNA MANTRA - Japanese OBI MINI REPLICA LP TITLES making a 8 CD Box Set- Japanese OBI MINI REPLICA BOX SET Japanese re-mastered Mini LP replica Limited Edition Collection Recorded from the finest Original Masters available. Each title Comes with anti-static sleeves similar to Vinyl LPs, Cardboard packaging exact to the original LP, re-sealable plastic wrap cases for protection of each collectible and include extensive Liner Notes Booklet. Actual miniaturized version of the 12" LP in 4" CD version Special VERY RARE LIMITED EDITION BOX SET ONLY PRODUCED ON FUTURES FOR THIS ONE TIME PRESSING -- were only available in Japan. First-pressing-only 8 CD box set containing paper-sleeve editions of POPOL VUH HOSIANNA MANTRA EDITION WITH THESE TITLES - AFFENSTUNDE - Affenstunde is the 1970 debut recording by composer and multi-instrumentalist Florian Fricke's Popol Vuh, named for the sacred Mayan text. Affenstunde is somehow akin yet very different. The music here all seems of a piece, despite the different selection titles and the single percussion piece on the set. The sheer momentum of the title cut, which closes the album and integrates spacious electronic soundscapes, ever deepening tonalities, found taped choral vocals whispering in the background, and percussion is one of the most provocative pieces to come from the Krautrock generation. This is an auspicious debut, which holds up wonderfully in the 21st century. This re-release features a 10:30 mins bonus track! Track Listings 1. Ich Mache Einen Spiegel - Dream, Pt. 4 2. Ich Mache Einen Spiegel - Dream, Pt. 5 3. Ich Mache Einen Spiegel - Dream, Pt. 49 4. Affenstunde 5. Train Through Time IN DEN GARTEN PHARAOS - Track Listings 1. In Den Garten Pharaos 2. Vuh 3. Kha-White Structures 1 4. Kha-White Structures 2 HOSIANNA MANTRA - Track Listings 1. Ah! 2. Kyrie 3. Hosianna-Mantra 4. Abschied 5. Segnung 6. Aschied 7. Nicht Hoch im Himmel 8. Andacht 9. Maria (Ave Maria) SELIGPREISUNG - Amon Duul II's drummer and guitarist Daniel Fischelscher joined Popol Vuh for Seligpreisung, which was originally released in September 1973. Other artists featured on this album are Eliscu, Veit and Wiese. This was the first album of a mystic trilogy devoted to holy books: Seligpreisung, Einsjager and Siebenjager, and Das Hohelied Salomos. The bonus track, Be In Love, is a special performance enhanced with violin and oboe from the same line up as Hosianna Mantra in 1973. Be In Love and Maria (Ave Maria) were originally meant to be released as singles Track Listings 1. Selig Sind Die, Die da Hungern 2. Tanz Der Chassidim 3. Selig Sind, Die da Hier Weinen 4. Selig Sind, Die da Willig Arm Sind 5. Selig Sind, Die da Leid Tragen 6. Selig Sind Die Sanftmutigen 7. Selig Sind, Die da Reinen Herzens Sind 8. Ja, Sie Sollen Gottes Kinder Heissen 9. Be in Love [*] EINSJAGER AND SIEBENJAGER - A sterling example of Popol Vuh's sound in their prime, and one of their more energetic albums. "Einsjager & Siebenjager" is a phantastic mix of rippling piano and fluttering blues guitar solos and cymbal-happy drum crashes. Compositions like "King Minos" and "Wurfelspiel" present the latent, rockier side of the band, and are just as much a joy to listen to as the more commonly manifested mellow side represented by "Morgengruss." The side-long title track, featuring all-too-intermittent visits from the beatific vocals of Djong Yun, nonetheless is a sophisticated composition and a piece of simply gorgeous music.This re-release features 2 bonus tracks: "King Minos II" (01:55 min) and "Wo bist Du?" (05:42 min). Track Listings 1. Kleiner Krieger 2. King Minos 3. Morgengruss 4. Wurfelspiel 5. Gutes Land 6. Einsjager & Siebenjager 7. King Minos II [*] 8. Wo Bist Du? [*] DAS HOHELIED SALOMOS - reissue of 1975 album for the legendary German electronic band. Popol Vuh emerged from the Krautrock movement and was the first German band to employ the Moog Synthesizer. Includes 3 bonus tracks 'In den Nachten auf den Gassen III', 'Schon bist Du vor Menschensohnen' (alternate session) & 'Mitten im Garten' (alternative piano version). Track Listings 1. Steh auf, Zieh Mich Dir Nach 2. Schonste der Weiber 3. In Den Nachten auf Den Gassen 4. Sohn Davids I 5. In Den Nachten auf Den Gassen II 6. Der Winter Ist Vorbei 7. Ja, Deine Liebe Ist Susser Als Wein 8. Sohn Davids II 9. Tranke Mich Mit Deinen Kussen 10. In Den Nachten auf Den Gassen III [#][*] 11. Schon Bist du Vor Menschensohnen [Alternative Session][Alternate Take][ 12. Mitten Im Garten [Alternative Piano Version][#][*] AQUIRRE - The title track is the ubiquitous soundtrack for Werner Herzog's classic film Aguirre, the Wrath of God, an excellent movie about a doomed party of conquistadors gradually swallowed up by an uncaring jungle. Fricke created here a transcendent masterpiece of ambience; seriously some of the finest melotron work ever recorded. This re-release features a 7:16 mins bonus track Track Listings 1. Aguirre I (L'Acrime Di Rei) 2. Morgengruss II 3. Aguirre II 4. Agnus Dei 5. Vergegenwartigung 6. Aguirre III [*] LETZTE TAGE - LETZTE NACHTE - Originally released in 1976. Features Florian Fricke: piano; Daniel Fichelscher: guitars, percussion; Djong Yun: vocal; Renate Knaup: vocal; Al Gromer: sitar and Ted DeJong: tamboura. Popol Vuh was founded by mastermind Florian Fricke in Munich in 1970 and are known as pioneers of electronic music as well as the predecessors of the 90's ambient and trance genre. Florian Fricke was one of the first German musicians who worked with a MOOG III, an instrument which created a very new and special sound which was profiled on Affenstunde. This album quickly became a milestone and practically created a whole new genre. The name and the book Popol Vuh stems from Incan mythology and is the memory of the evolution of humanity. Florian Fricke doesn't like to catagorize his music; "Music is a form of law for me." He died on December 29, 2001 in Munich. Kraut Rock at the highest level made by, and for music fans Track Listings 1. Der Grosse Krieger 2. Oh Wie Nah Ist Der Weg Hinab 3. Oh Wie Weit Ist Der Weg Hinauf 4. In Deine Hande 5. Kyrie 6. Haram Dei Raram Dei Haram Dei Ra 7. Dort Ist der Weg 8. Letzte Tage/Letzte Nachte 9. Wanderschaft-Wanderings [#][*] 10. Gib Hin [Session Version][#][*] 11. Haram Dei Ra [Alternative Version][Alternate Take][#][*] These are Japanese digitally re-mastered Mini LP replica CDs (the OBI Edition). This Limited Edition Collection has only VERY FEW made world-wide and are immediately Out of Print. Recorded from the finest Original Masters available. Comes with anti-static sleeves similar to Vinyl LPs, Cardboard packaging like an LP, includes extensive Liner Notes Booklet. Actual miniaturized version of the 12inch LP in 4inch CD version.